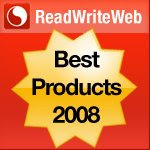 ReadWriteWeb have posted their list of the Top 100 Products of 2008. It's a great list with the likes of Twitter, Seeqpod, Last.fm, Remember the Milk, DimDim and SearchMonkey just to name a few, joining the ranks. Last.fm is definitely a personal favourite, as are Twitter and Seeqpod. The list is extensive and if you haven't heard of all of these products you might want to spend a little time getting acquainted over the holidays. After all, a lot of them are for fun as well as business!